Last night we went to Hing Kee, a much praised restaurant doing Bo Jai Faan or claypot rice that’s tucked in a grimy backstreet behind the tourist thronged Temple Street Market. The restaurant’s popularity, and the ongoing buzz about it on openrice, meant that as usual there was a long line of people waiting outside. They have a lot of tables in different shops round the area, though, so the queue moved pretty quickly. But does Hing Kee’s food actually live up to all the hype it gets? 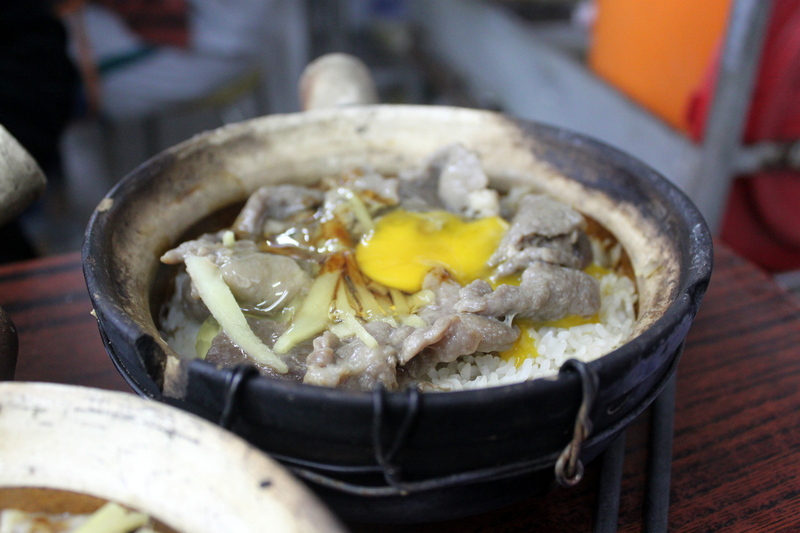 Bo Jai Fan’s combination of rice and meat cooked in a clay pot is fairly simple, unpretentious, and hearty in style. So there’s not much a restaurant can really do to distinguish itself in terms of fancy cooking techniques or ingredients. But Hing Kee sets itself apart from other Bo Jai Fan restaurants by getting this basic combination absolutely spot on. Our beef clay pot came with a big pile of succulent strips of beef laid on top of the rice, contrasting with a lot of restaurants which are really miserly with their meat. We broke an egg over the dish and the white soaked down into the rice, cooking as we mixed it and covering the grains with a fluffy eggy tasting coating that made the rice really hearty and heavy. This savoury egg coated rice combined well with the more juicy strips of beef mixed in with it. 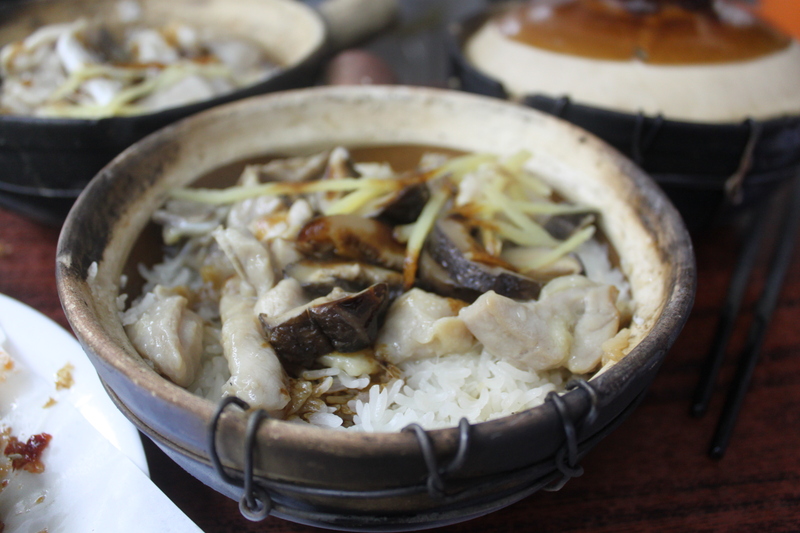 Our second pot was chicken and Chinese mushrooms laid over rice. The small pieces of on the bone chicken were impressively juicy – the method of cooking perhaps allowing them to keep a lot of moisture so that they hadn’t dried out at all. The meat’s soft creaminess went well with the more earthy and fibrous texture of the dark Chinese mushrooms used. 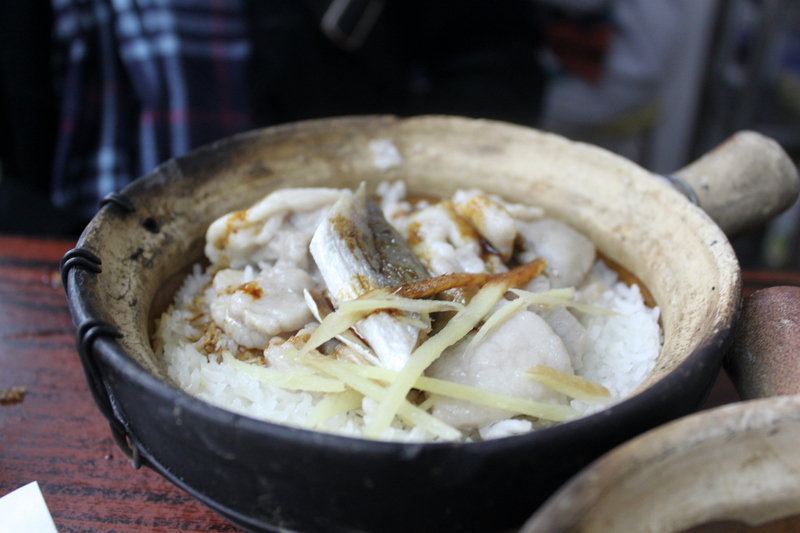 The smoked fish and pork pot also had a nice balance of different flavours. Big pieces of silver skinned fish were laid on top of the rice. The dry, coarse flesh of this had a really striking and powerful flavour – salty and fishy and smoky all at once. 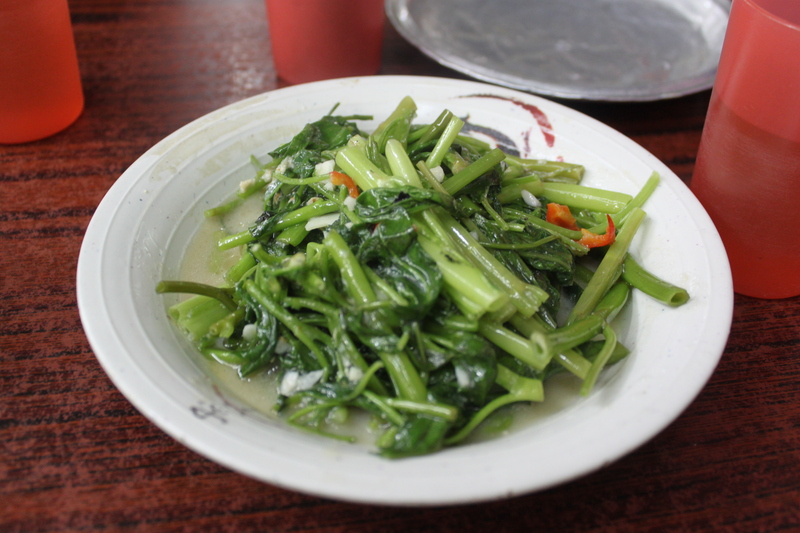 Its intenseness was nicely softened, though, when eaten with a soft slice of the pork or some of the rice. Strips of ginger also added a really nice sweetness. With all Bo Jai Fan, the rice at the bottom goes a crispy brown as it cooks against the side of the pot. It can be really nice to scrape up pieces of this crisped browned rice, that have a great crunchy taste. Here we did get some perfectly crisped rice, although some of it had also turned a little bit too black to be edible. For the clay pots to be absolutely perfect, it would be good if they weren’t burnt on the bottom at all, but that might be asking a bit too much. 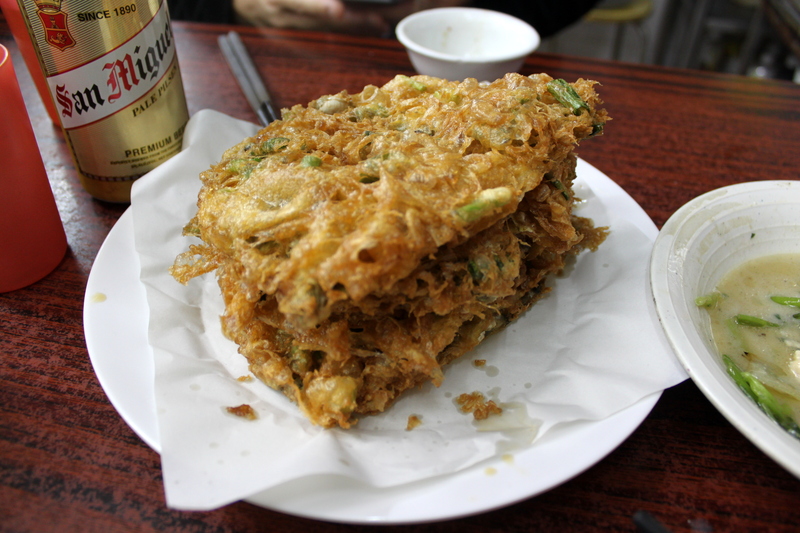 Along with the clay pots we also had ho beng, or deep fried oyster omelette. This was perfect. In some restaurant’s the omelette is too thick and just the outside is fried and crispy, leaving a stodgy mess of uncooked egg and oyster inside. But here the tangled strands of egg were all nicely crisp and brown with just a thin layer of soft egg in the middle. Often I also find places use too many oysters, so these completely overpower things, but here they were nicely restrained, with just a few of the juicy oyster held in the crispy casing and plenty of spring onion mixed in too. Added to this, the omelette was really dry and crisp, with none of the soggy oiliness that some can have. It had clearly just been made and tasted fantastic. So overall, I would say that Hing Kee definitely lives up to the praise it’s been given and is well worth the half hour or so you’ll have to wait. While other restaurants around do also serve fairly decent bo jai fan, many of them slip up on a few elements of the dish, while here you can enjoy clay pots that are almost exactly the way they should be. This entry was posted in Cantonese, Hong Kong, Uncategorized and tagged Bo Jai Faan, Cantonese, Hong Kong, Local Restaurant by nolczak. Bookmark the permalink.